Ukash Virus infection is a generic name of a ransomware program which is becoming extremely popular all over the world. It has many different interfaces adjusted according to the targeted country and its official language. The cases of Ukash Virus infections have been detected in the States, Canada, and some European countries including the Netherlands, Poland, Germany, France, Belgium, Spain, Portugal, etc. Depending on the country, an authoritative body is presented as investigating the issue of supposed illegal actions carried out by the computer’s owner. The infection is designed to constrain a user from accessing the computer’s programs and the Internet. The lock-down of the machine is explained to the user as a result of visiting pornographic websites, storing pornographic videos or pirated copyrighted material such as songs, videos or software. 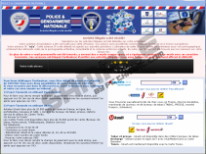 Although the message claims that the user could be prosecuted, it is possible to ransom the computer’s system by paying a ransom payment, which varies in currency. The fine is typically 100 currency units in dollars, pounds and euros. It is important to keep in mind that the message is written by cyber criminals; hence, it should be ignored, whereas the infection should be removed. If the issue presented in the message were real, the police would not attempt to punish criminals by locking computers down and exacting money from their holders. 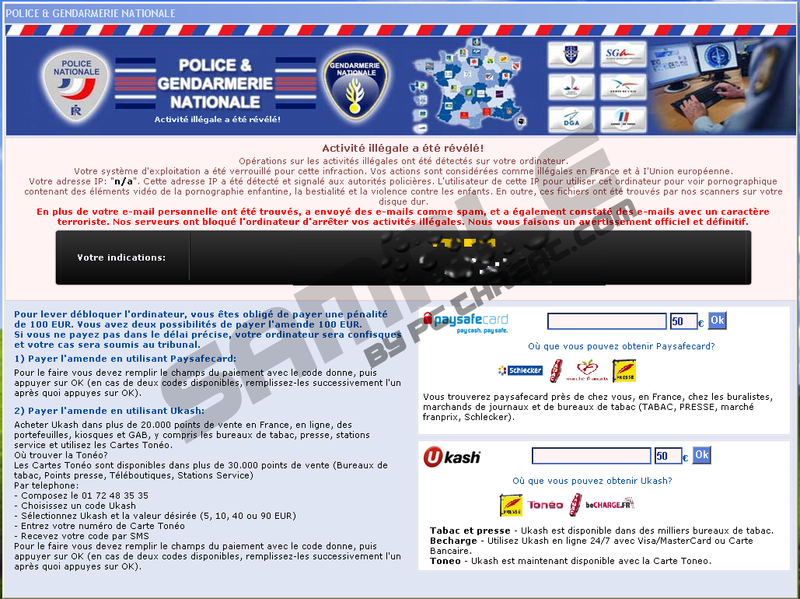 Thus, ignore Ukash’s and Paysafecard’s logos as well as emblems of the police of different countries. The following variants of Ukash Virus infection have been detected in the countries mentioned above: FBI Moneypak or FBI virus, SABAM virus, GVU virus, SGAE virus, SACEM virus, SPAUTORES virus and others. Any of them detected on the PC should be removed immediately, because only after Ukash Virus infection’s removal the victimized computer’s processing is back to normal. 1. Restart the computer and press F8 to load Safe Mode with Networking. 3. Install SpyHunter in Safe Mode with Networking and remove Ukash Virus infection. 1. Follow the instruction steps 1 and 2 above. 2. Click on Start menu and launch RUN. 3. Type “msconfig” into the box and press Enter. 4. Wait for System Configuration menu to appear and select Startup tab. 5. Uncheck all the programs on the list and press OK to save changes. 6. Restart your computer in Normal mode, install SpyHunter and terminate Ukash Virus infection. The removal tool will detect and remove Ukash Virus infection; moreover, the application will provide you with all-time protection so that the system is secure from malware attacks. Quick & tested solution for Ukash Virus infection removal.